It’s been awhile since we’ve done a good review of exactly what’s happening when you have roots in the sewer line. Here are the steps that happen before you give Garvin’s a call for sewer cleaning. The Cause: Why the heck are roots even in there in the first place? Well, they’re looking for water and nutrients. 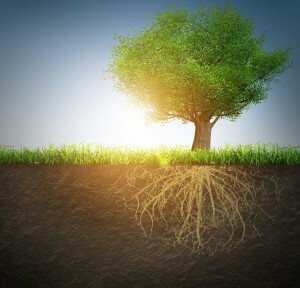 Trees send out roots underground in every direction, and they have absolutely no qualms of using your wastewater as a source of life. Think about it, even in a drought they will have constant water. In fact, a drought can make things even worse, as the tree will redouble its efforts of growing roots at the source of water. PVC pipe is usually pretty good at keeping tree roots out, but they will still get in at joints as glues weakens over time. The Problem: Well, we all like trees and don’t mind if they’re stealing a little bit of water. Of course, the problem is that roots can start a clog. And often we’re not talking about big roots that our blackwater can get past; we’re talking about tiny roots that can get through tiny cracks and then turn into a mass that can resemble a spider web. And what’s the purpose of a spider web? To catch stuff. These roots will start to catch everything you send down, including grease and toilet paper and whatever else you send down the toilet. The Solution: When you have roots in the sewer line, the solution is rooter service. We’ll send down spinning blades that will clear your pipes from edge to edge, chopping though not only the roots but also everything that the roots have collected. This sends it down into the much larger public sewer system. The roots will eventually grow back, so now that you know your pipes are prone to root problems you might want to consider preventive drain cleaning to make sure everything keeps heading down at the right clip. Keep Garvin’s number close by so that you can call us at the first sign of trouble.